Of course one of the fun things that happened to me just before leaving New York was my dentist finding that one of my fillings had failed. So with two weeks until my flight I scheduled a root canal and crown, finishing up the last of the visits a day before leaving. Now my dentist had cautioned me that while I could get the work done in the U.K. the mastery of skill she had seen on the teeth of patients that she had that had moved to the U.S.A. from the U.K. had given her reason to believe it was wiser for me to get the work done before leaving. I wasn't sure if it just marketing on my dentists part or not but I went ahead with it mainly because I didn't want to travel with a bunch of X-Rays. When I got here to the U.K. while I was shopping for food the first week there was a woman giving out free samples of yogurt. When I smiled and politely refused any, her response was "Well you must be doing something right, since you have a beautiful mouth of teeth." I thought it a little odd but just chocked it up to culture shock on my part. I don't like stereotypes and I have had to deal with a lot of them about Americans while here. And, I thought I was doing a pretty good job about it too of not letting the stereotypes influence me. 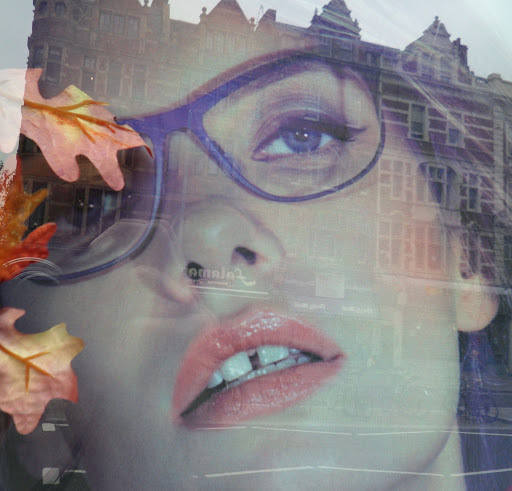 That is until I saw this picture in the window of an eyeglasses shop.